March 19, 2019 8:00pm The Vancouver Playhouse, 600 Hamilton St. Replacement for the Juilliard Quartet, which regrettably has cancelled its performance. Distinguished by its virtuosic playing and impassioned interpretations, the Ariel Quartet has earned a glowing international reputation. 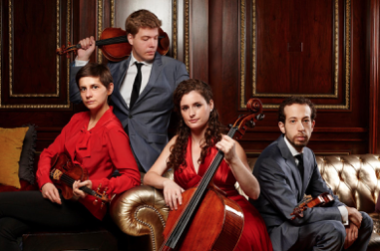 Formed in Israel nearly twenty years ago when its members were middle-school students, the Quartet has received the prestigious Cleveland Quartet Award. The Ariel serves as the Faculty Quartet-in-Residence at the University of Cincinnati’s College-Conservatory of Music, where they direct the rigorous chamber music program and perform their own annual series of concerts in addition to their busy touring schedule.